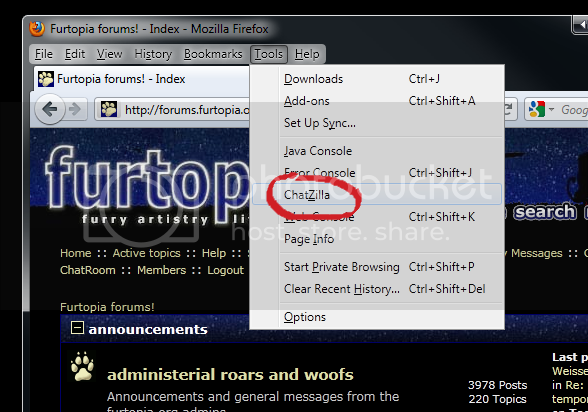 How to use an IRC client [For mac and PC users] - furtopia.org services support - Furtopia | Family Friendly Furry Forum and IRC Chat! I'm also adding excessive screenshots for those who are better with pictures than text. 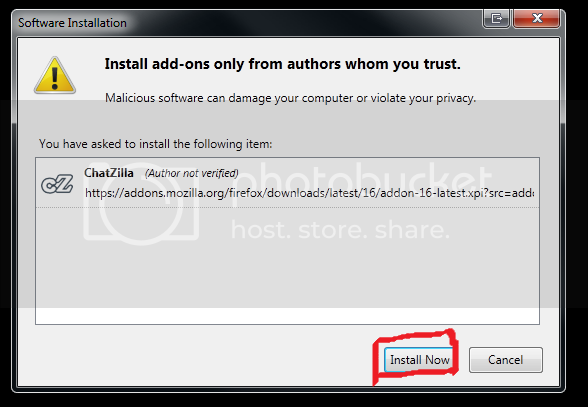 Click, "Add to Firefox," and then, "Allow,"
A short timer will count down on the window that pops up. After it hits zero, click, "Install now." Now you need to Restart Firefox Firefox will prompt you to restart. If you accidentally miss it, just close all the Firefox windows. Now type whatever your fursona, or IRC nickname is into the nickname field. Scroll down. You can also set a default quit message which will be displayed every time you leave the channel, and a username, which will be displayed when someone types /whois <your nickname> and next to your host-mask in many clients. Mine, for example, is, "rawr". 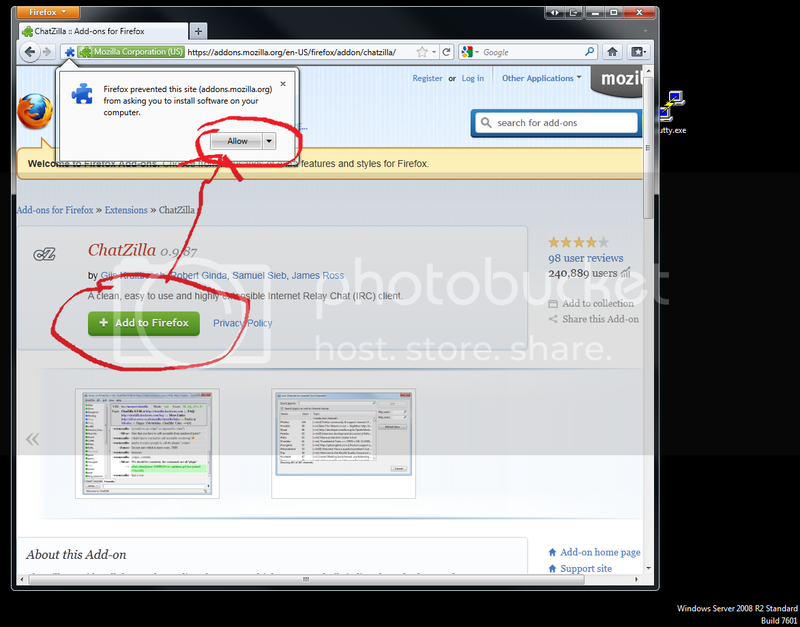 Click, "Okay," to close preferences, You should be back at the main ChatZilla window. /attach is a command telling the client to connect to an IRC server. Note: You must use a lower case a for the /attach command. Several people have PMd me because they used an upper case A an they got an error message. 6007 is the port that furtopia's ircd listens for. 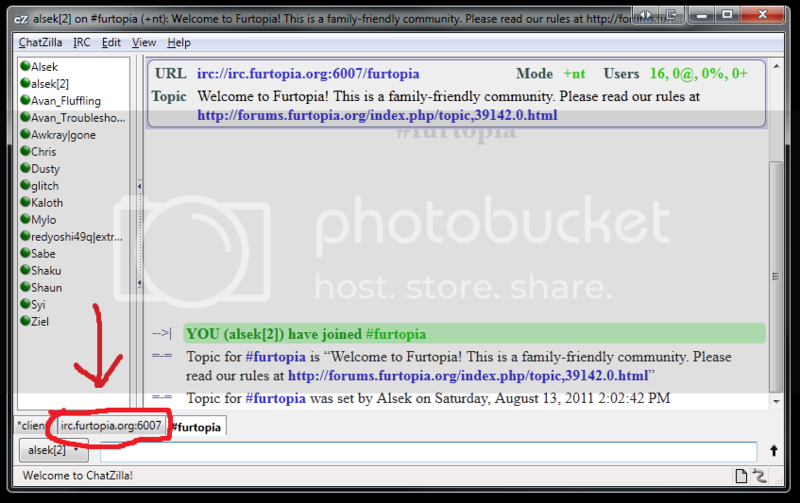 Most IRC servers use port 6667, Furtopia IRC however uses port 6007 in order to prevent spambots from joining; so you have to specify. You can do this at any time, but if you're already in a channel you'll need to click onto the server tab to see the list. /me sets out some limes. If anyone has any IRC clients they want me to add have at it. My experience with Android and Mac is very little. "I've never talked to a girl before. I don't know how to handle it." "Hey everyone! Isn't this fun? The door opens to the inside, right?" "Oh, by the way... my blood is black."